Root Rescue announces the Product Launch of Transplanter MS-CS at the LO Congress Show 2016! Well, we got the green light from the CFIA on December 9th, 2015, when (after a 6-1/2-year wait) our New Product Registration finally came down the wire from the CFIA in Ottawa. Since then we've been hustling to get our packaging designs finalized and hit the ground running for spring. The LO Congress came on so fast that we were unable and (truthfully) unequipped to get a booth ready for the show - so we did the next best thing - we turned to our friends and asked for help. Case Vanderkruk and company at Connon Nurseries NVK have been essential industry partners in the University of Guelph Transplanter research program from the get-go. They began working with the University in 2010 - and have never looked back. Case is a great nursery industry booster and has always supported initiatives and programs that he feels will help the industry at large. 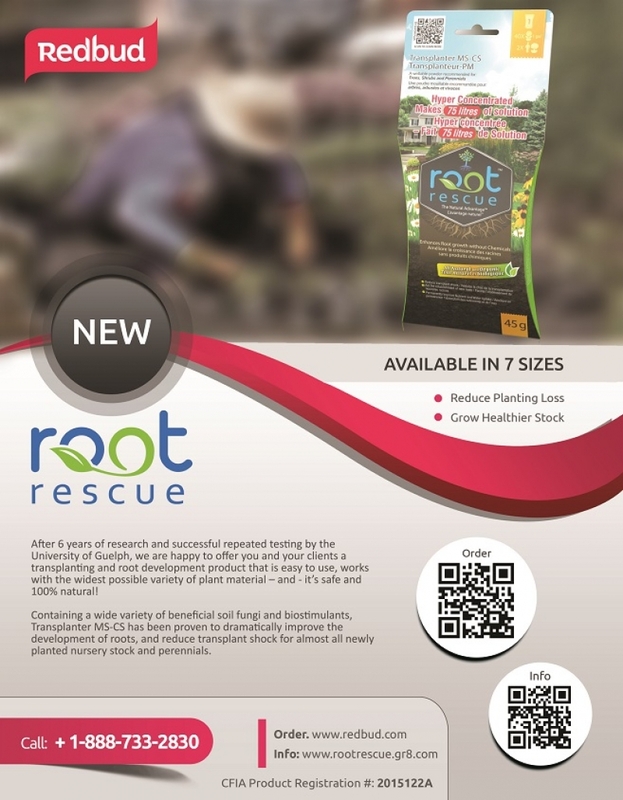 When we asked if he would give the University access to plants - and turn over space and resources to test Root Rescue's new multi-species mycorrhizal inoculum for landscape plants - he readily agreed to help. So when we found ourselves without a booth at the Congress Show, we reached out again - and he agreed to let us make our pitch from NVK's booth at the show. The NVK booth is one of the busiest at the annual LO Congress show, so we had no trouble striking up conversations with folks about our new product launch. Everett DeJong (from Redbud Supply - our Canadian Distributor) and I were kept busy in the booth and in the aisles talking with folks - many of whom had been hearing talk about this product for years now. To be honest, I didn't think that it would take over 6 years to get through the regulatory process with the CFIA. When I filed the application in 2009, the folks in Ottawa (whom I've met personally several times over the last few years) said that it might take 3 years to get done. Not quite. So there's been lots of anticipation building for the product's release. So now we're here - and we have 6 different package sizes for Retailers and Contractors. We also have a bulk size just for Growers. If you're a Retailer and you'd like to offer your customers our 'All-Natural Plant Starter - For Life', then get in touch with Redbud Supply, and Everett will get you going. If you're a contractor - I happen to know that NVK will be carrying our Contractor sizes at their yard on Hwy #5 in Dundas. Case's cousins Rob and Company (another great industry research partner of ours) at Connon Nurseries CBV in Waterdown will also be offering both consumers and contractors our new Transplanter MS-CS starting this spring. And away we go - more news to come.